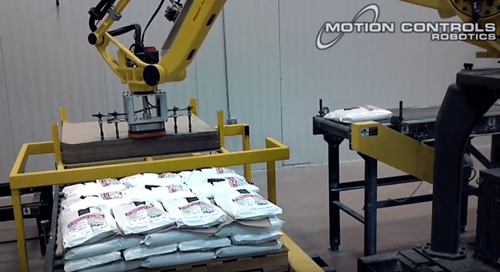 Motion Controls Robotics has designed a variety of bag palletizing systems that are not only flexible but fast (high speed). 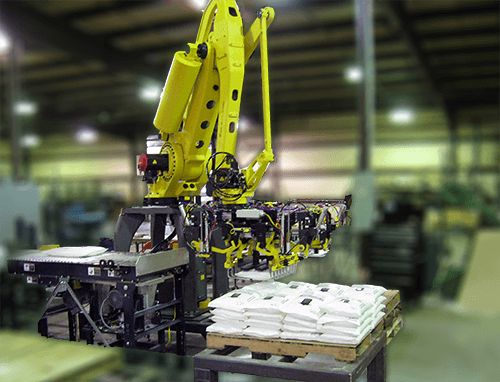 The key to success in bag palletizing relies on two main ingredients: system design and a custom end effector. With the use of FANUC’s PalletPro software, we perform simulations to find the optimal stacking scenario. MCRI’s custom designed end effector is what allows for our high speed operation and quick product changeover. Using these combined efforts we have designed systems that reach 28 bags a minute. We can meet your needs, whether you’re looking for a system that works fast, handles single or multiple product lines.